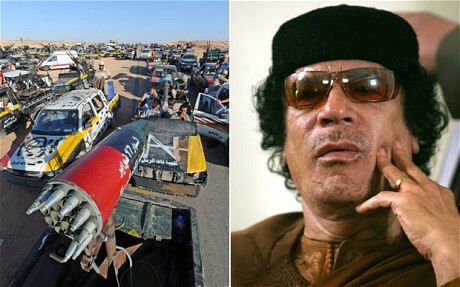 Forces of the new authorities in Libya have seized the airport and surrounding areas of the Gaddafi heartland town of Sabha as they search for the former dictator in the desert. The former rebels have been beaten back from the two other major cities holding out for Col Gaddafi, Bani Walid and Sirte, after concerted attacks last week and over the weekend. But on Monday they claimed they were advancing on Sabha, 400 miles to the south, having taken a number of desert towns and villages. Sabha is the traditional territory of the Gaddafi tribe, and the former leader is himself believed to be hiding in friendly desert territory not far away. “The airport of Sabha has been liberated by our fighters,” a military spokesman, Col Ahmed Bani, said in Tripoli. “Also two villages near Sabha have been liberated. He said Sabha’s celebrated desert fort, of symbolic value as its picture features on Libya’s ten dinar note, had also been seized. The rebels’ failure to take Bani Walid and Sirte have cast a shadow over the rebel takeover of Tripoli a month ago. Since then, the rebel National Transitional Council’s members have spent more time on internal politics than forming a coherent strategy to pacify the rest of the country. That has been left to individual, fiercely competitive and often disjointed brigades based on fighters from individual cities. The NTC’s chief executive â€“ the de facto prime minister â€“ Mahmoud Jibril yet again failed to win backing on Monday to his proposed new cabinet, the announcement of which was due on Sunday but has been delayed indefinitely. Appointed while the revolution was centred on Benghazi in the east, he has been under pressure to expand representation from both western cities including Tripoli and from Islamist groups. The latter are thought to have won five or six seats, while the former have also won key posts. But in the meantime Mr Jibril’s popularity has plummeted so far that his own position is being widely questioned. The Gaddafi regime spokesman, Moussa Ibrahim, has capitalised on recent rebel reversals to say that its troops had won victories in Sirte and Bani Walid. He also claimed that 17 mercenaries, from Britain, France, Qatar and an unidentified Asian country had been captured in Bani Walid. The claim was denied outright by the French government, while British defence sources said they were unaware of any of their personnel in the country going missing.